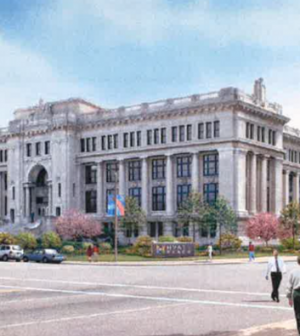 From St. Louis Post-Dispatch: After an uncommon bout of questioning two weeks ago that held up a proposal to rehab the vacant municipal courts building downtown, a key city commission advanced the project Thursday with a unanimous vote. The St. Louis Tax Increment Financing Commission recommended approving about $8 million in TIF assistance for a $60 million proposal to turn the historic city-owned building on Market Street into a hotel. The measure needs final approval from the Board of Aldermen. A joint venture between Nelson Construction and Development of Des Moines, Iowa, and St. Louis-based Vertical Realty Advisors plans to buy the building from the city for $2.4 million. The building has been vacant since the city’s circuit court functions moved to the old federal courthouse across Tucker Boulevard over a decade ago. Their proposal calls for a 150-room hotel project (city documents identify it as a Hyatt Place, but the developer said an official announcement would come later) that would turn old courtrooms into a bar, install an indoor pool and revamp the systems of the century-old Beaux Arts style structure. It had appeared to get caught up earlier this month in mounting concern over the city’s development incentive policies, which became a major issue during the recent mayoral campaign. The developers faced more pointed questions than usual at the last TIF Commission meeting, where a 2-1 vote with two abstentions failed to give the project the majority of TIF Commissioner support needed to advance. By Thursday, much of the concern seemed to have subsided after commissioners received market studies on the demand for downtown hotel rooms and additional information on the minority hiring practices of the general contractor, Paric Corp.
“Just getting the information, the questions answered that I had asked before, just made me a little more comfortable with what we were providing,” Commissioner Christina Bennett, who voted against the proposal last time, said after Thursday’s meeting.